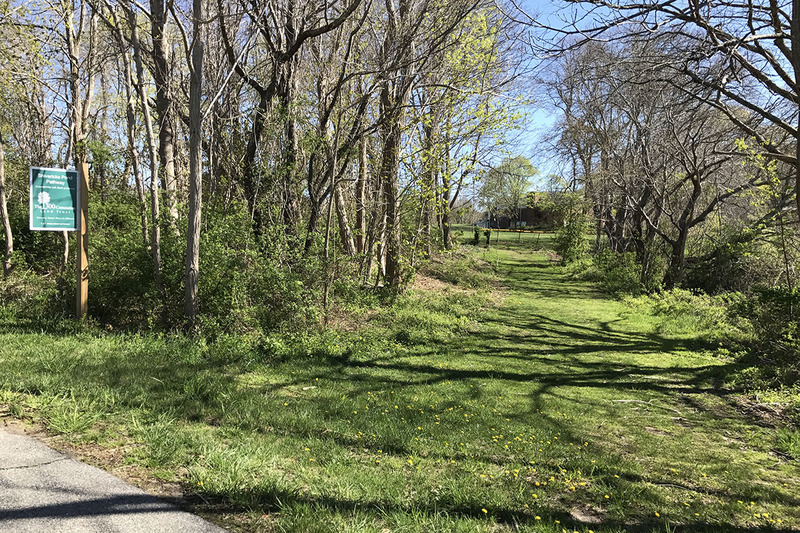 This 0.67 acre parcel on Katherine Lee Bates Road in donwntown Falmouth was purchased by The 300 Committee in 2015 from the Bank of America in a bargain sale. It was an orphan lot created when the Town laid out and built the road in the 1950s. Although it was owned by Falmouth National Bank and all the successor banks prior to Bank of America, it has been routinely used as the access link between the Lawrence School property and Falmouth town center. The 300 Committee wanted to ensure that this public access would continue and stepped up to make the purchase when the parcel was headed for auction and the Town could not act in the Bank's time frame. In summer 2015, a portion of the Shivericks Pond Pathway was a demonstration project for invasive vine removal. This work has opened up the parcel, making it more inviting to the public. The long-range concept is to coordinate with the Town on a plan to make Shivericks Pond more of an aesthetic and accessible asset.